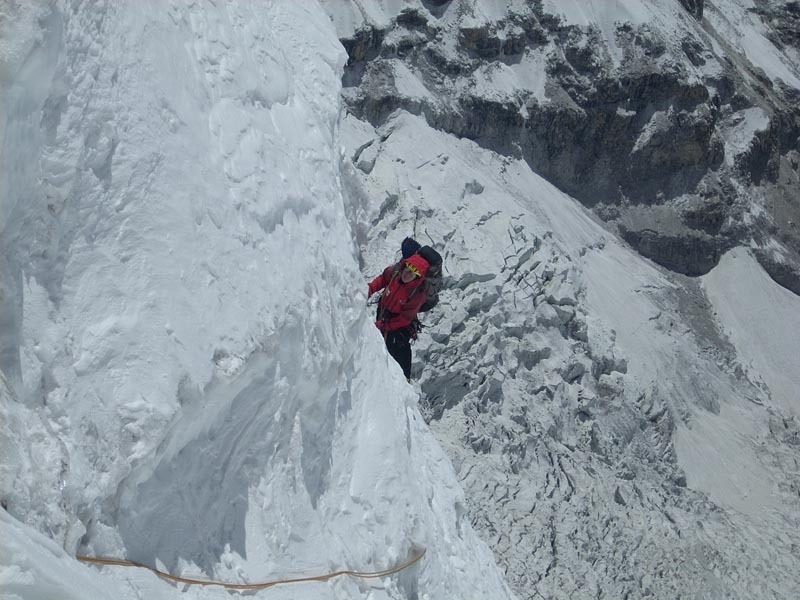 Unfortunately, during several weeks some reasons were preventing me from writing about the route on Cho Oyu. 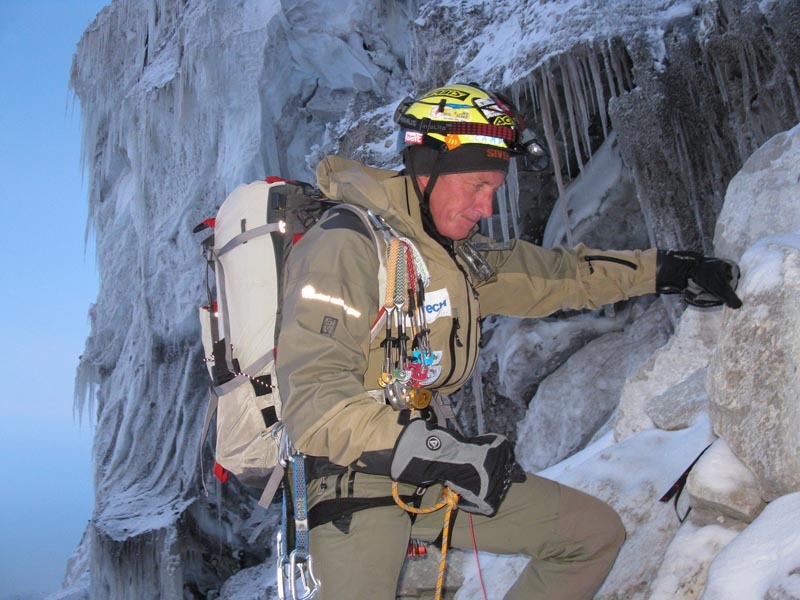 For about two years Boris Dedeshko and I have been climbing difficult routes together. 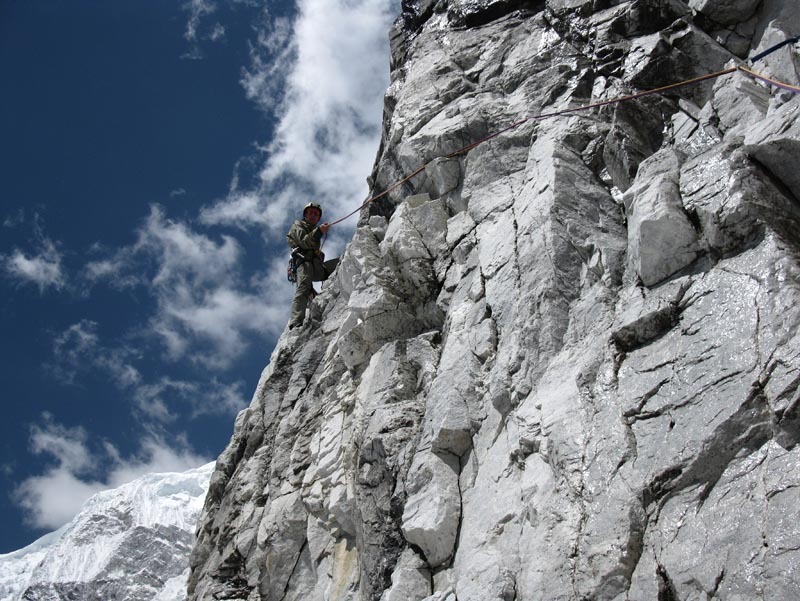 He is keen on mountaineering and taken up with the result. 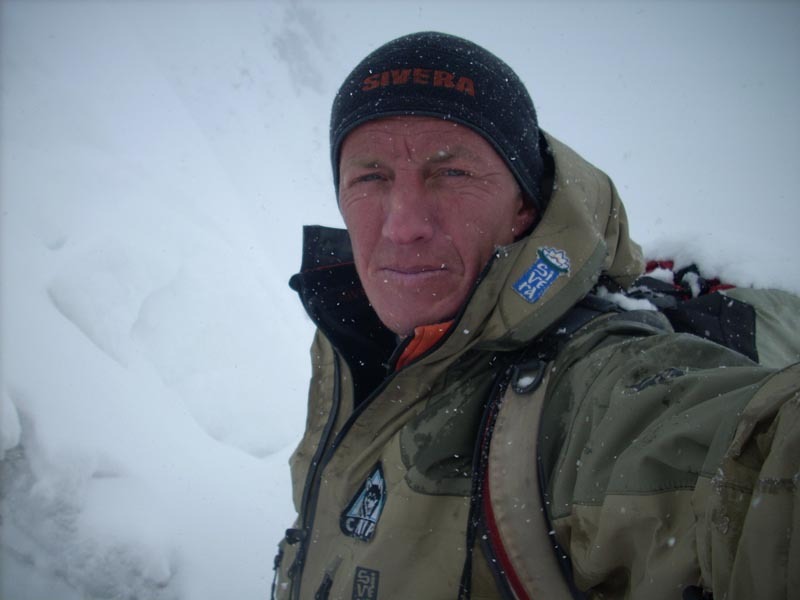 Besides technical training he has also a high altitude experience – Khan Tengri, Makalu, Eight Alpinists Peak (Pik Vosmi Alpinistok). And we have become friends. So, it happened that in the beginning of April we were in Nepal, thinking how to competently use sponsors money for the planned apotheosis. Our sponsors were «NewTech» and «Kazakhstan Kagazu (Казахстан Кагазы)» companies. 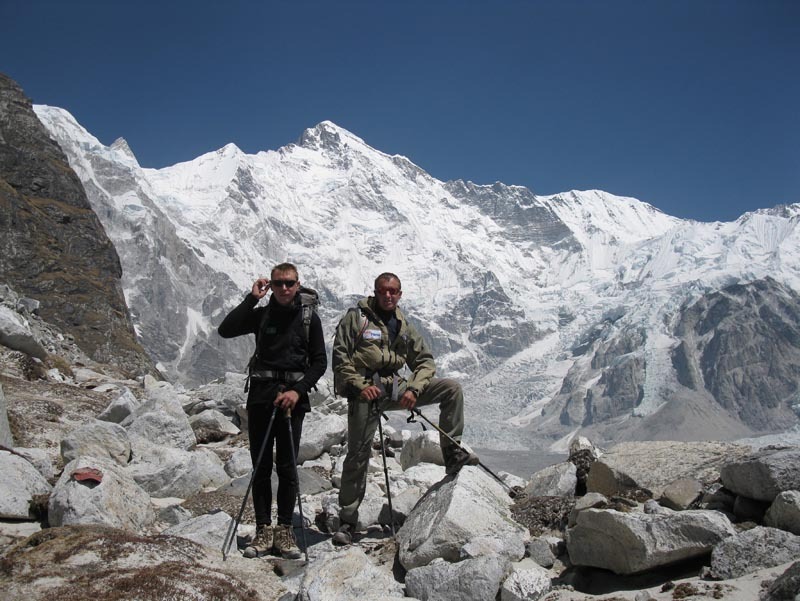 We got acclimatized in Khumbu region, firstly trekking on easy scree slope up to 5,800m high. Andrew Starkov, a painter, accompanied us, and we wanted to look on this beautiful region. 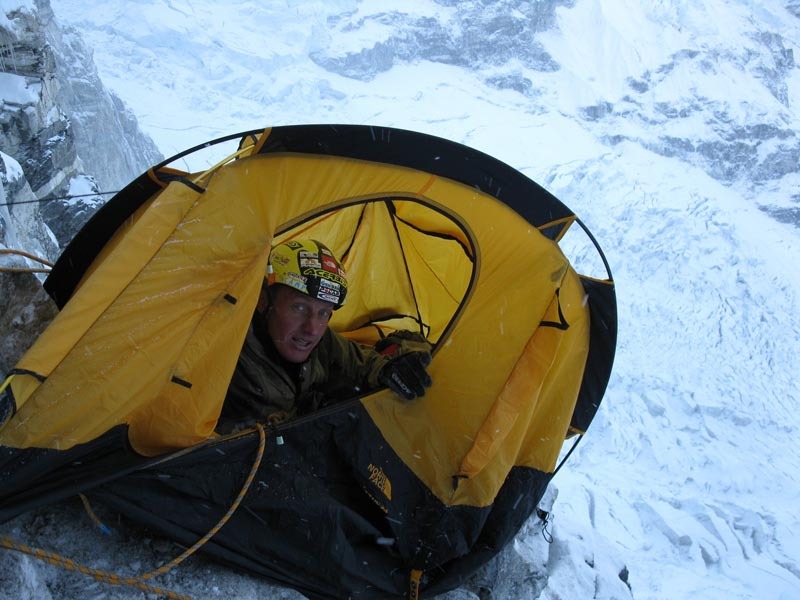 Meanwhile Mingma, my companion in several Himalayan expeditions, came to Gokyo gorge to install Base Camp. 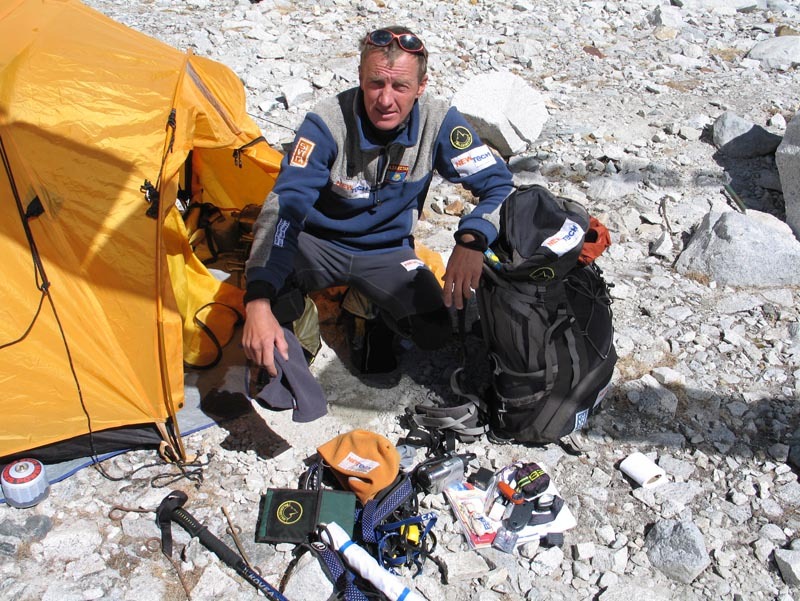 When Boris and I arrived at the foot of Cho Oyu on 15 April, having trekked a lot via the passes, everything was ready for the expedition. We didn’t want to start our route before the ascent itself, and we went to the slopes of Ngozumba-Kang for acclimatization. 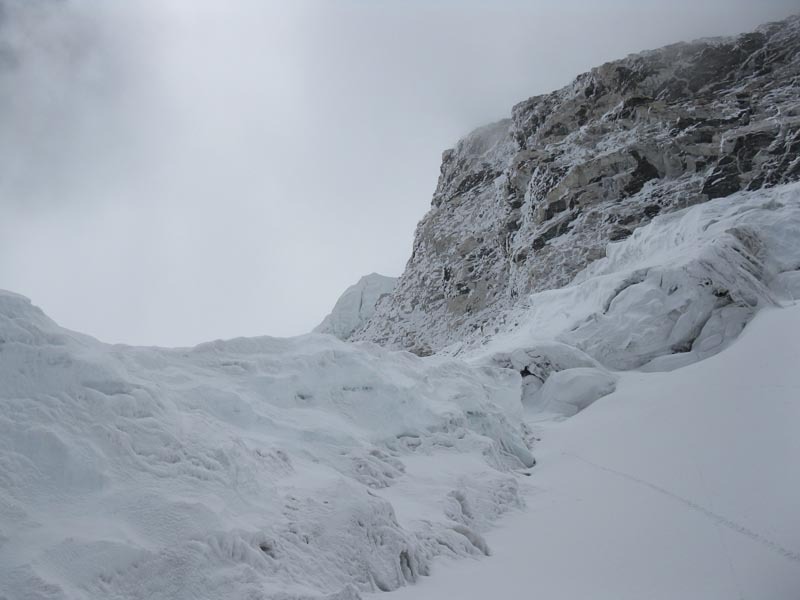 There we dodged in the icefalls and in five days reached 7,100 m altitude. We bivouacked and then descended. This pattern had been worked through long ago. 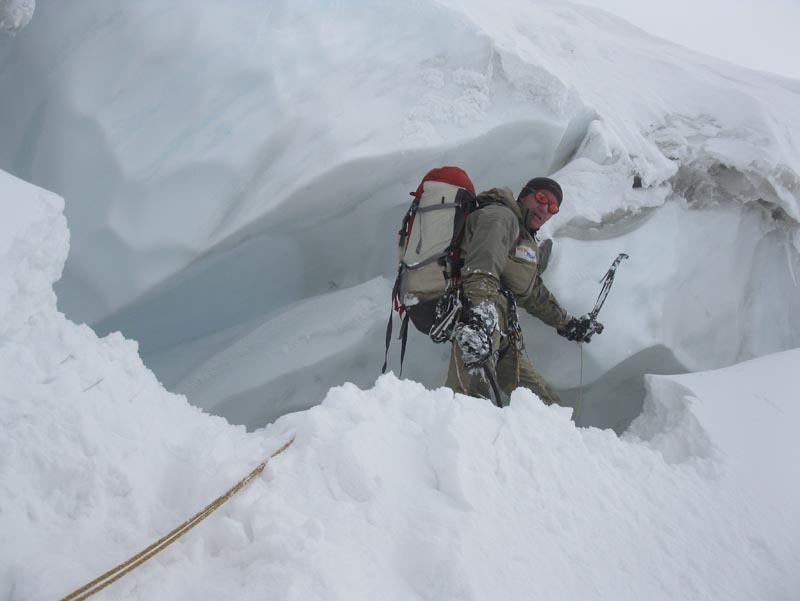 1,5 weeks later, on 6-th May, after being ill and having rest, exploring the approach to the South-East face of Cho Oyu, we left our Base to push our main objective. We had food for 5-day ascent and 1-day descent, planning to descent via the 1978 Austrian route on the East slope. We brought only a half of our tent on the route - an inner tent with two stakes instead of four ones. After camping at the foot of the mountain on 5,300 m altitude we started in the dead of night. Base of the route was at 5,600 m, and we ascended with belay to 5,800 m. Generally, we had to choose and estimate the line very strictly. There were several icefalls above, and if something falls it would hit us. Fresh afternoon snow also didn’t hold up, producing spindrift. 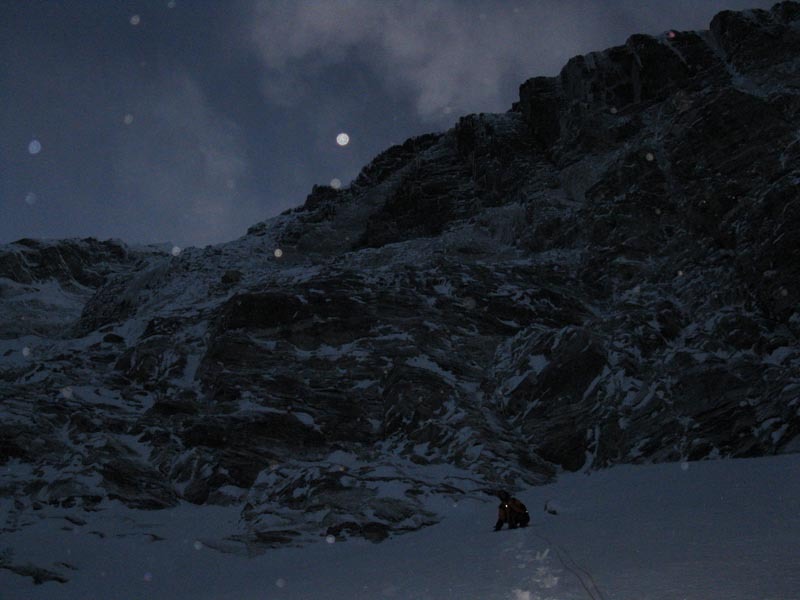 During the ascent and night on the lower rock section avalanches and stones were flowing down in 2-3 meters distance. We worked on two 9-mm ropes. After some easy rocks the bastions began. 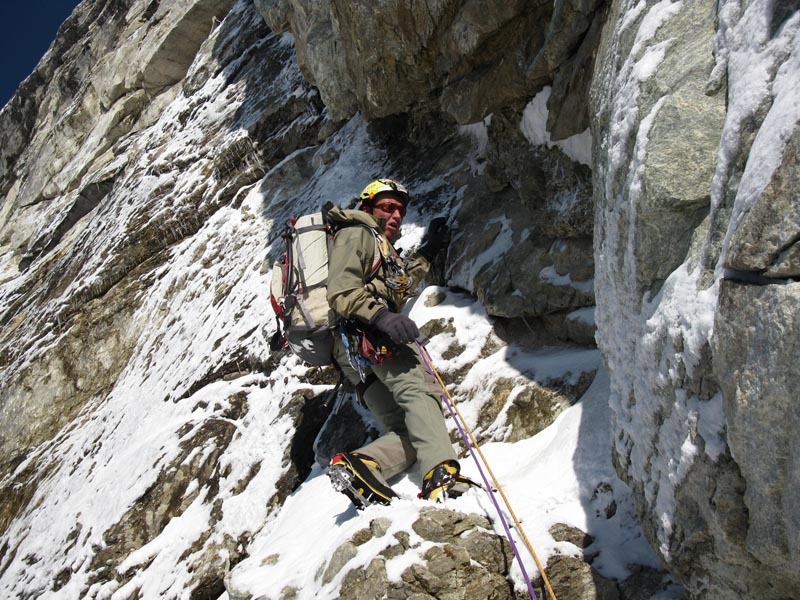 Sometimes it was possible to ascend in climbing shoes, but frequently we had to wear crampons we also dodged in ice couloirs a lot. That day we could only climb to the overhanging level, where we camped at 6,100 m altitude. We spent the night half-sitting in the tent and in the foggy dawn we continued the ascent. The overhang lasted for about 80 m, and we aided much. Beyond the edge it was a series of ice slabs and gullies, and we reached 6,600 m in snowfall. 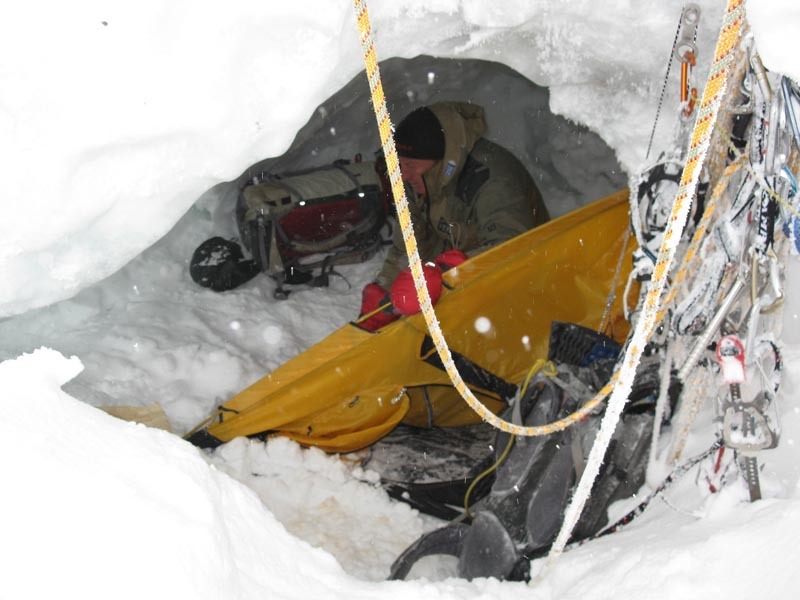 Here, under the shelter of serac, at the base of the ice sickle, we camped. Next morning was marvellous. 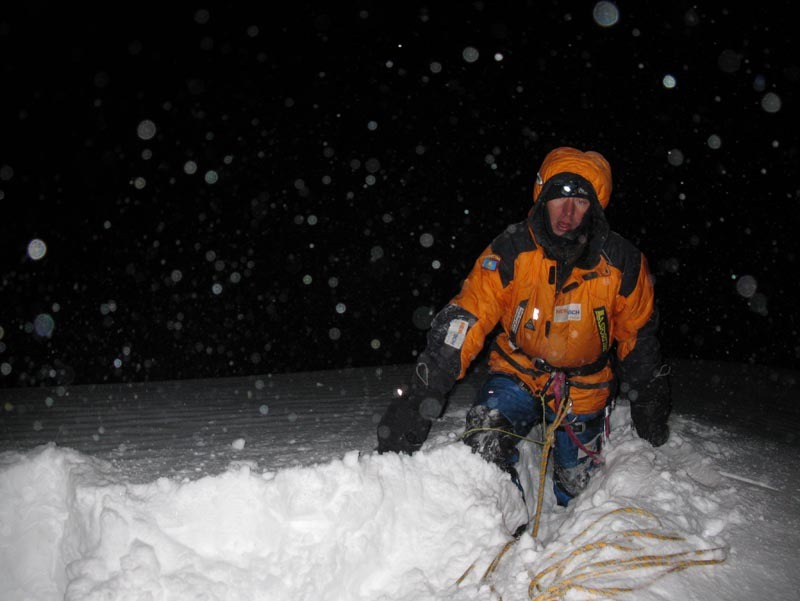 We had reached about 6,900 m via the series of ice ridges when bad weather came from the west. I’d like to mention that season 2009 differed from the usual rates of Himalayan weather conditions. Instead of everyday afternoon snowfalls with rare short storms 2-3 days long the weather was contrasting. Clear weather lasted 4-5 days, then a cyclone came for the same time period. That day we reached 7,100m. It’s better not to remember how I climbed via the horrible snow areas. We squeezed our tent under a small bergshrund. 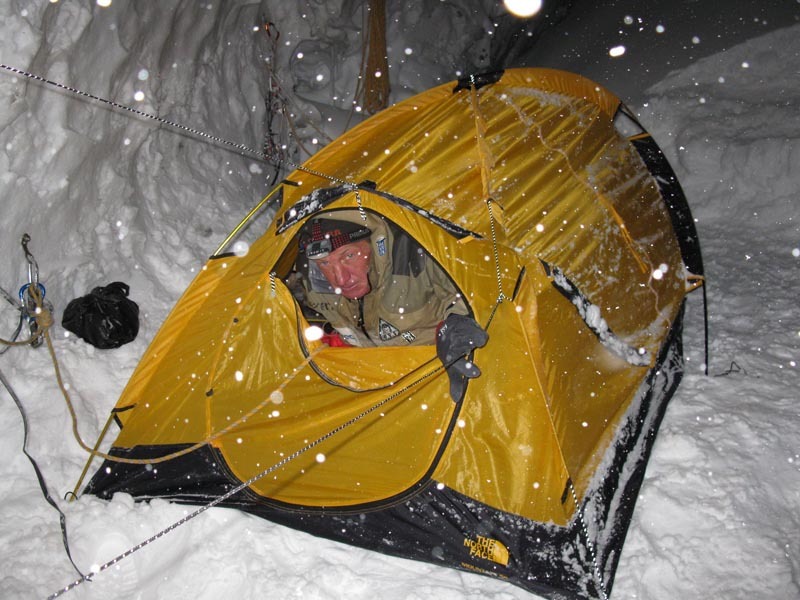 In the night strong avalanches flew over us several times we knew it due to boom and vibration under our sleeping mats. The weather didn’t improve in the morning, but under the shelter of this bergshrund, which slanted up and right, we could catch hold of the rocks. 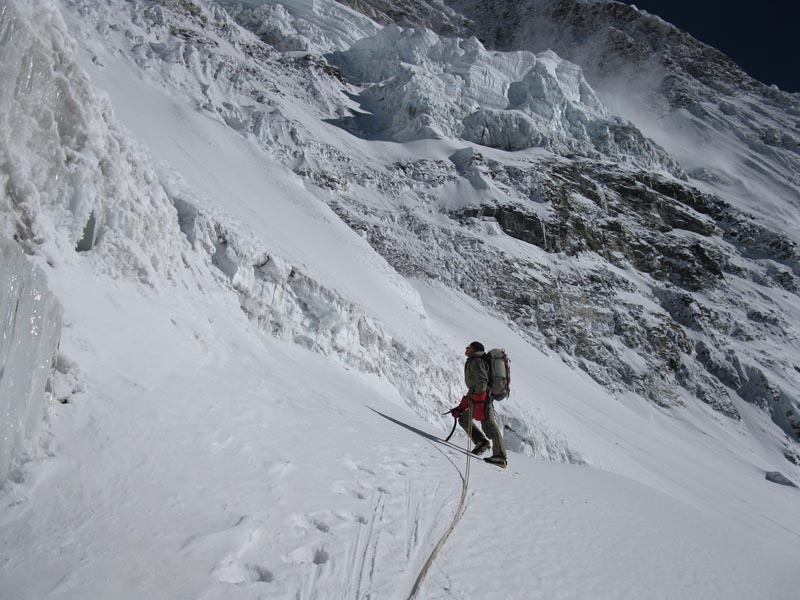 We followed them till 7,300m, then traversed to the right under the serac level. 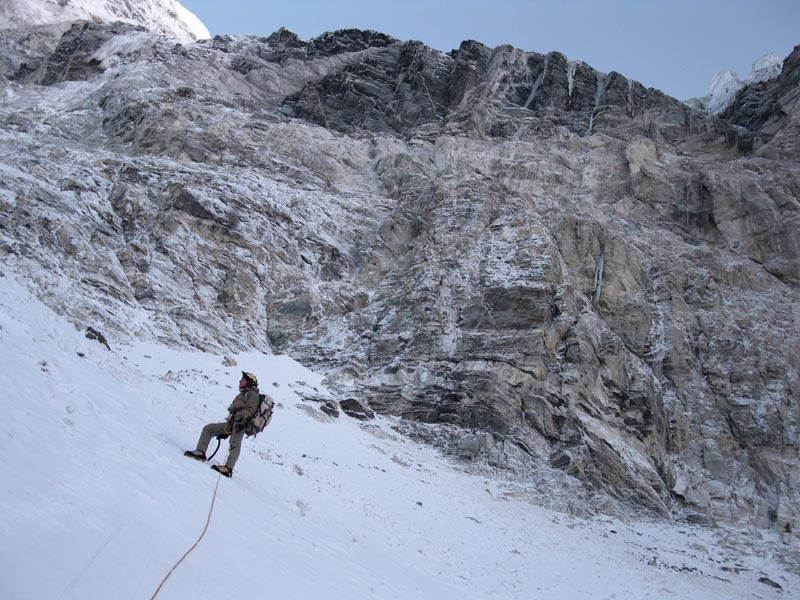 We were lucky that fresh avalanches didn’t hold up on such slope, the snow covering the rocks and ice was rammed, and we climbed more or less easily instead of technical and physical work. 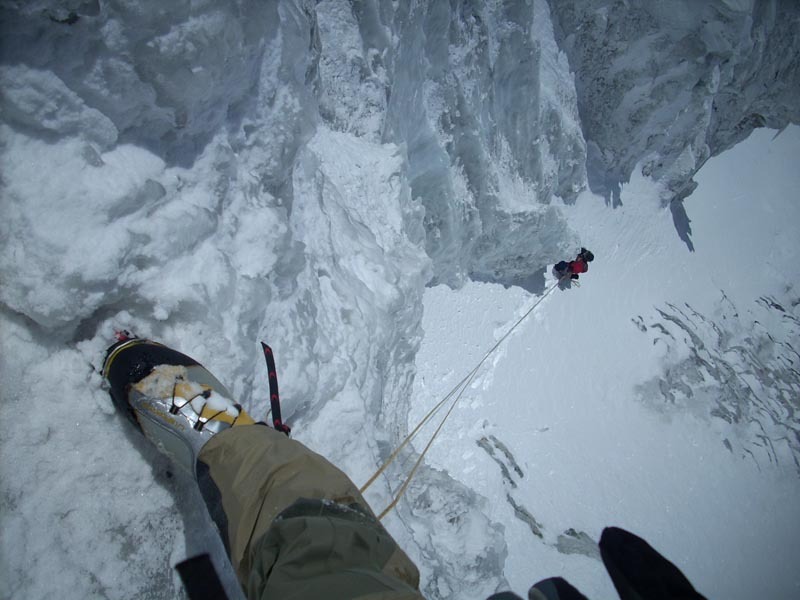 Though once a half-meter avalanche started under my feet and bowled down Boris who was belaying. But we had to work at full scale when bypassing the icy overhangs. 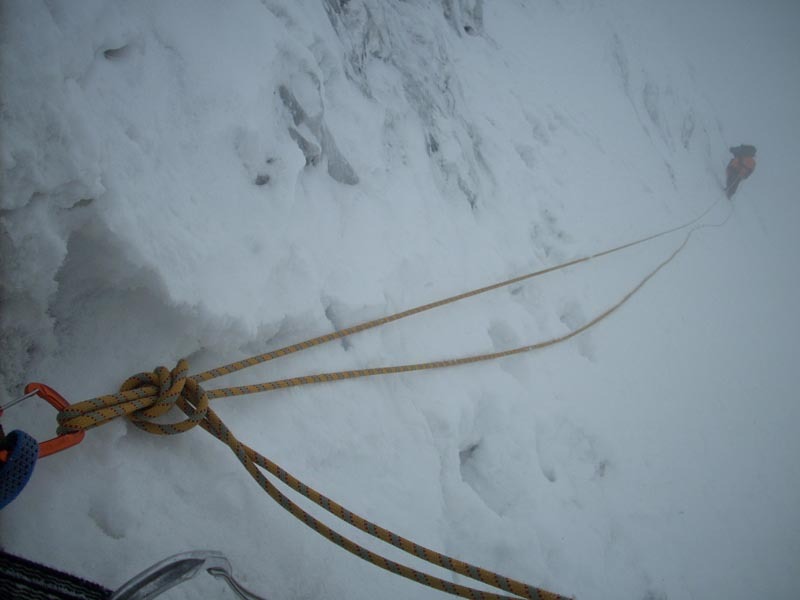 Sometimes snow was waist-deep, and icy walls were useful for belay. 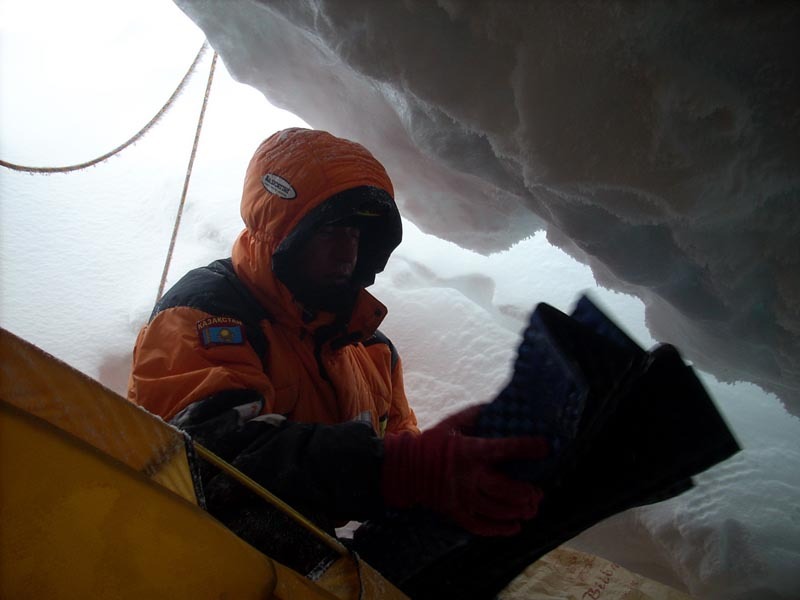 By twilight we reached 7,600 meters and again dug under a small bergshrund. By then it was time to change our tactics and the route line. Considering difficult snow conditions, descent along the Austrian route wasn’t possible. 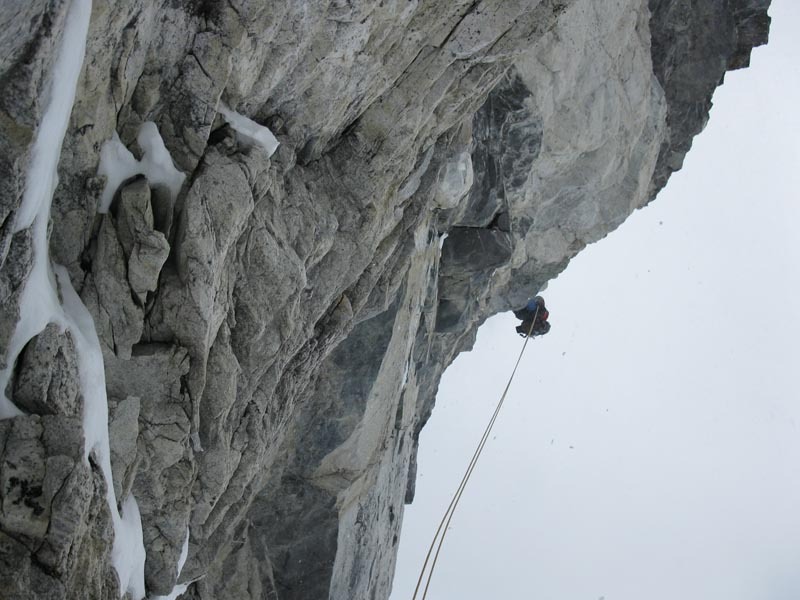 Therewith, the route which was planned as absolutely independent led to the left, in a dangerous couloir. 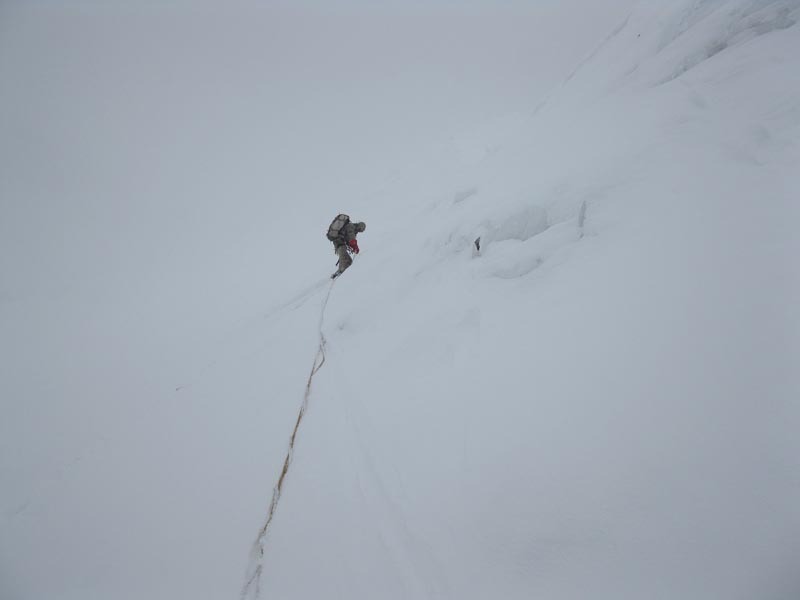 So we decided to climb on the South-East ridge to the Polish route, and to descent along the ascent line. In the night on 11th May the weather became better. All the same it was very cold and scary. 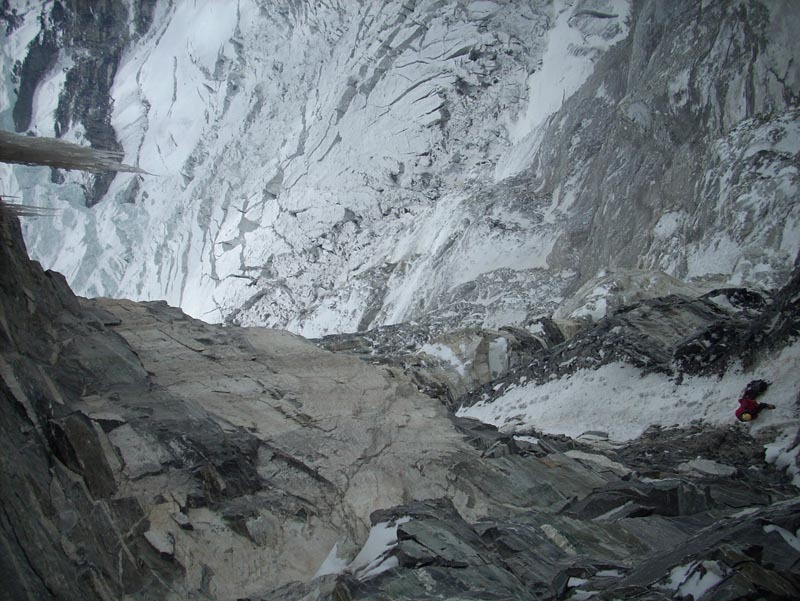 Only about 4AM we ventured to leave the tent and climbed diagonally to the right and upwards, belaying by rocks and ice denudations. We had several quickdraws, a set of nuts and friends, 6 ice screws. Again we were lucky that the day before there were strong avalanches of fresh snow and the lower level was firmer. 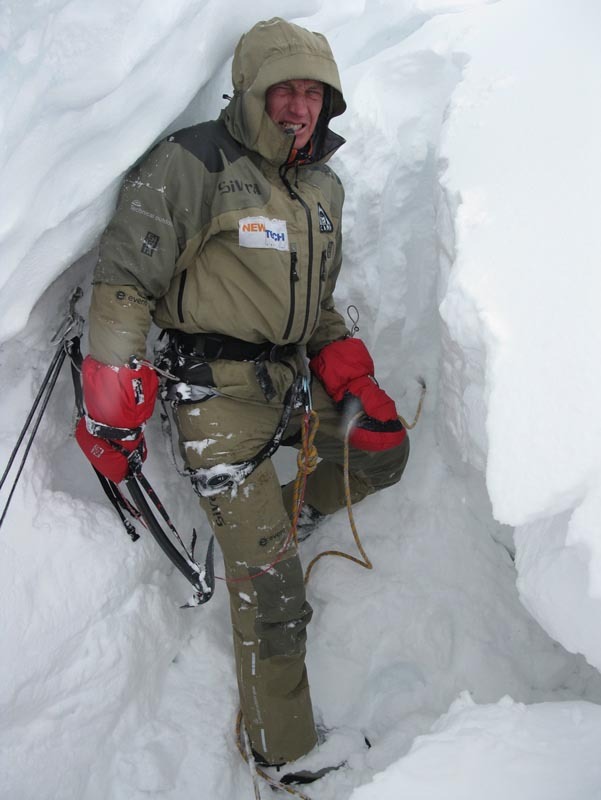 But sometimes on the traverses of the couloir branches we moved waist-deep in snow. 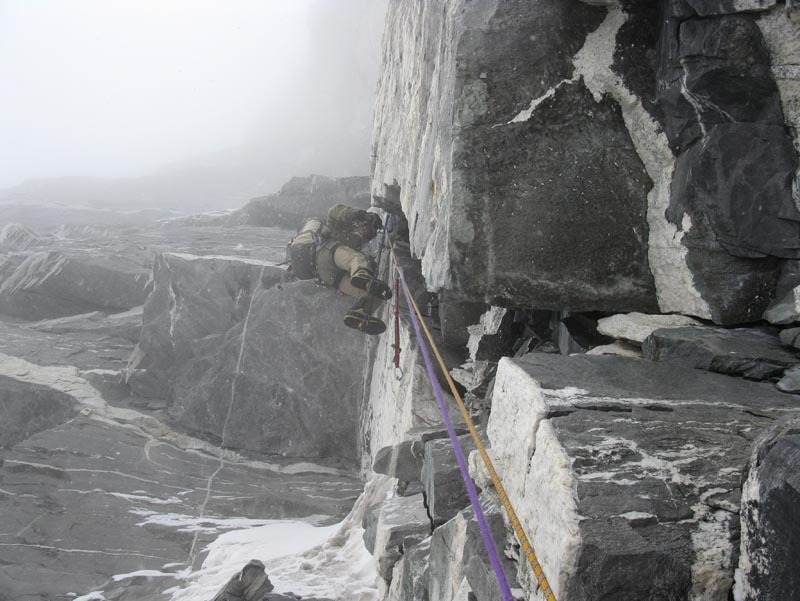 At about 09 AM we turned and climbed on the ridge to the left of the couloir, then via two easy rocky walls we reached the “Polish” South-East Ridge at about 7,950 m altitude. On the turn I decided to leave a rucksack in the snow for orientation. The way lied via a series of snow cornices among the wide areas of soft snow. 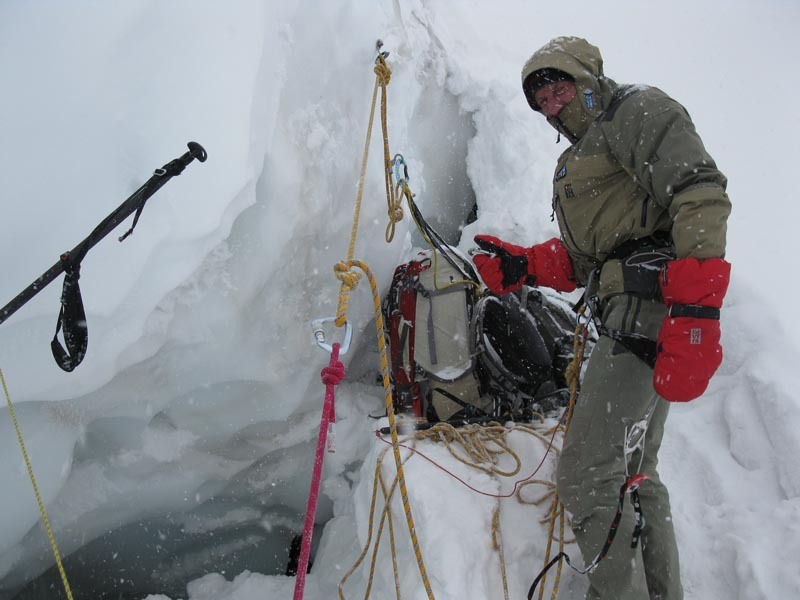 We belayed mainly by ice hammers, sometimes ice screws, digging in the snow. 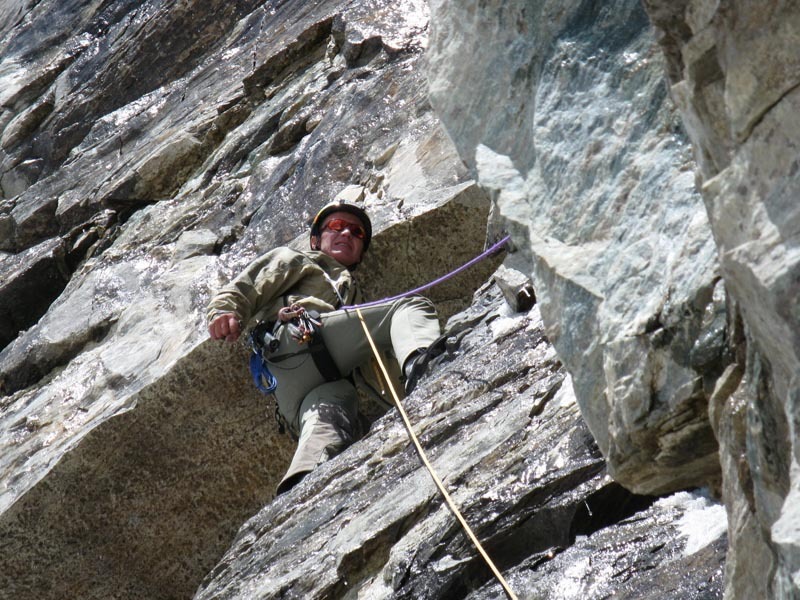 We pushed forward rather slowly and got tired, therefore we belayed not always reliably, but we were lucky. 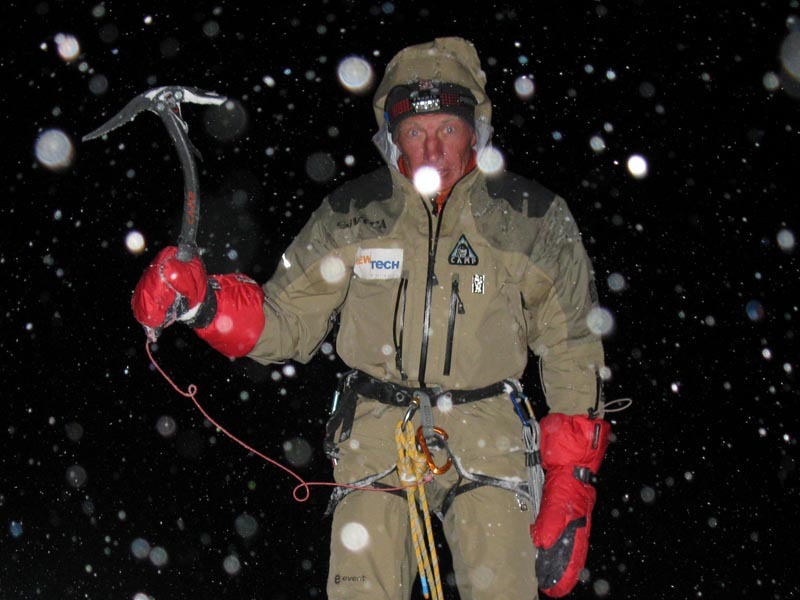 The weather was foul – light breeze, boring snow and tight fog. 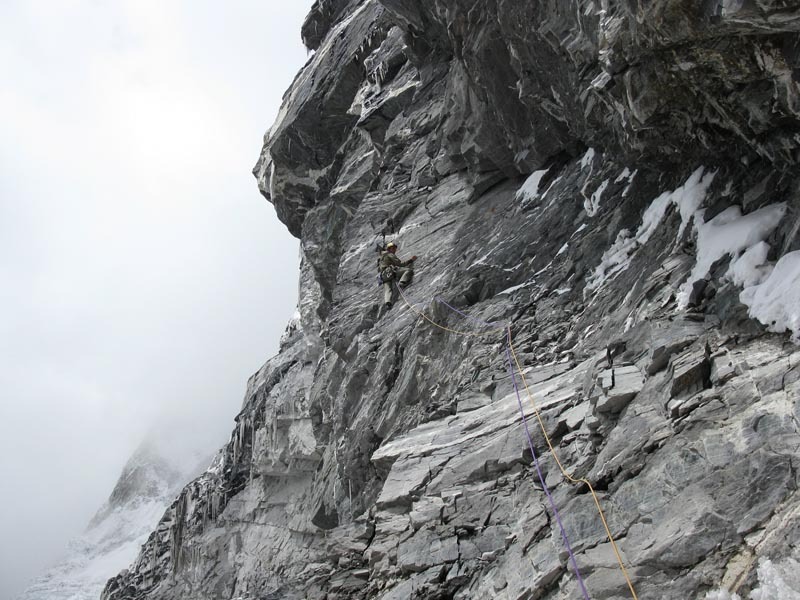 We orientated on a distinctive rocky tower-horn left of the ascent line. It could be only discerned. To the right we saw rocks and seracs of the plateau edges. Under the abrupt section in the last gully, where it was a real avalanche danger, we decided to return. Therewith, the darkness came. But obstinacy and malice won. We continued. The snow drifted by west wind accumulated on the East slopes. So, we were waist-deep in snow. 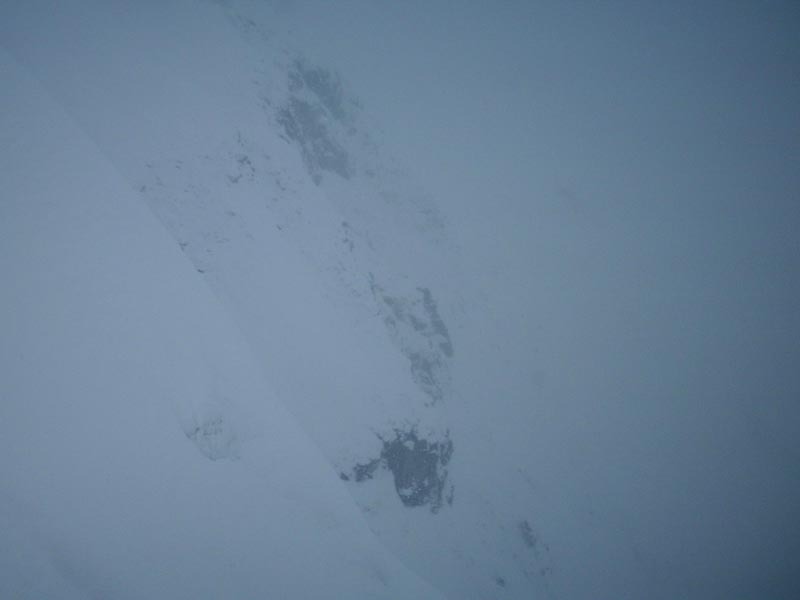 Only on the last section of the ridge, in about 200 meters from the summit, it became knee-deep. 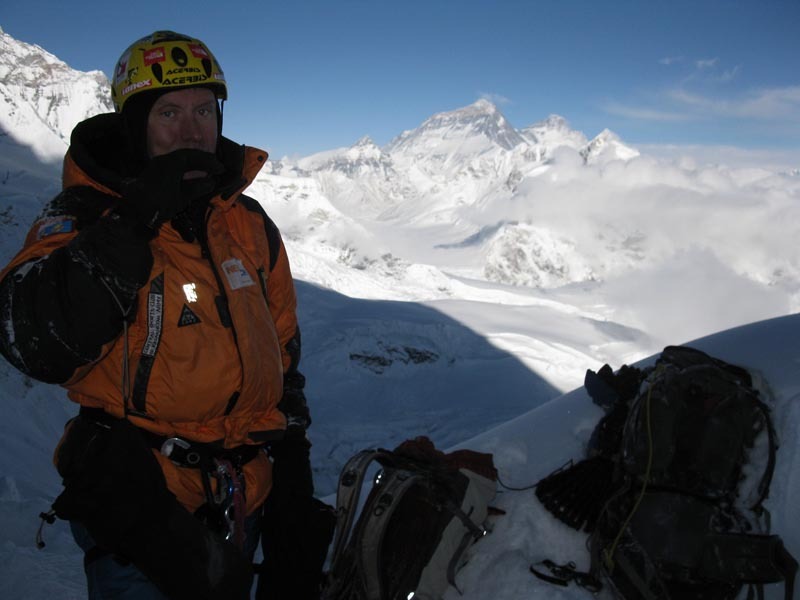 At 20.10 we reached the plateau of Cho Oyu. 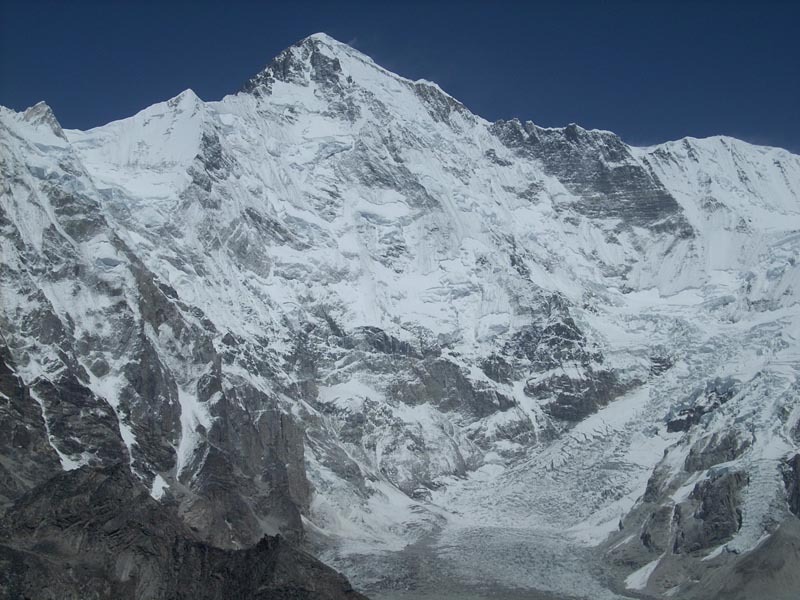 The ridge broadened, the slope bended, and the plateau to the direction of Tibet appeared. We made photos and started descent. Our way was well seen because of the ploughed track. And on the turn 7,950 it was my rucksack. 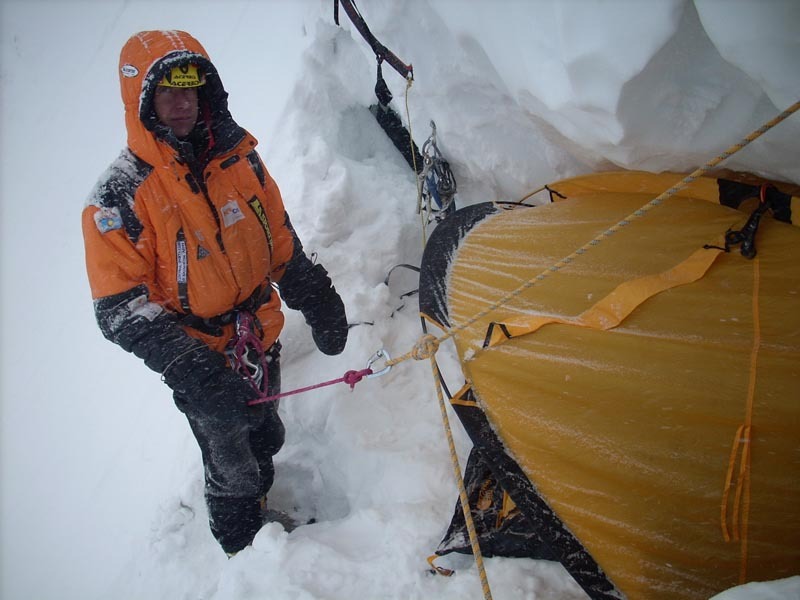 We descended without any problems, and at nearly 00.30 we reached our tent at 7,600m. Early start was prevented by the heavy snowfall. We decided to wait. 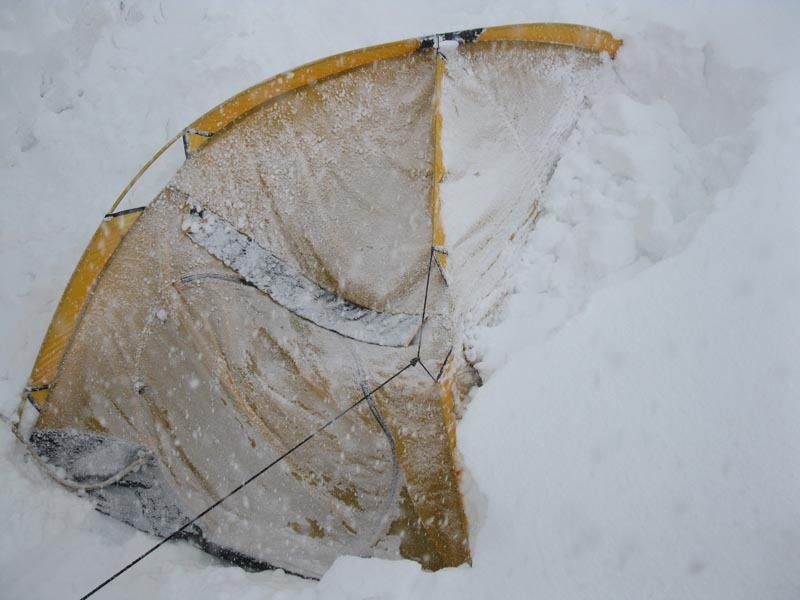 But the avalanches began to bury our tent and to press it out of the overhanging bergshrund. Once or twice we were fully buried. 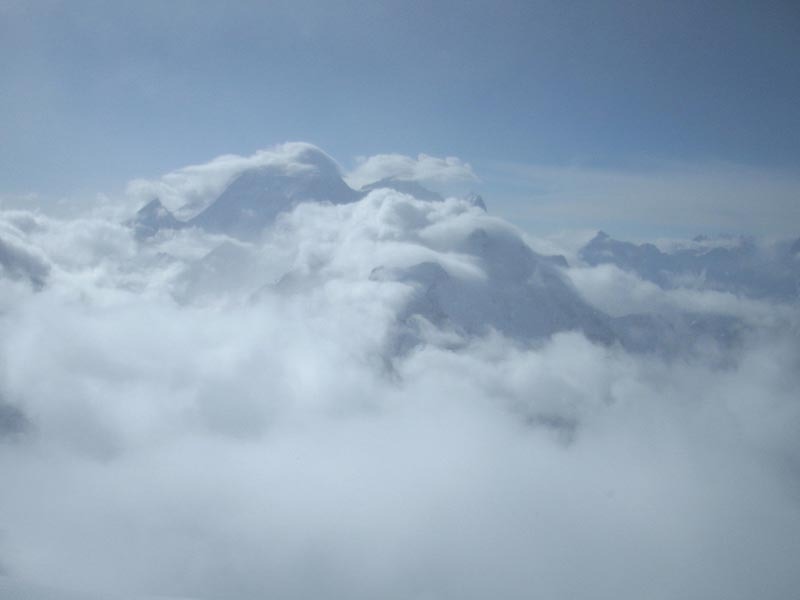 At nearly 8 AM on the east in the cloud break we saw Mount Everest and Lhotze. We decided to force our way down, though the bad weather was returning. Again it turned that fresh snow fell down as avalanche, and we had time to cross quickly the most dangerous section under the serac level. Only once when during rappelling a piece of ice or a stone flew out from Boris and badly hurt my head. Boris and I spent this night in a small cave under the bergshrund. The snowfall continued. Avalanches were everywhere, something was collapsing and crashing, at times flying over the bergshrund and pouring our tent with dust. We had only tea left, as well as 100 G of dried horsemeet. Next morning the story repeated. At about 08 AM the sun appeared for half an hour, and we ventured to continue. We rappelled in 25 meters on double rope. 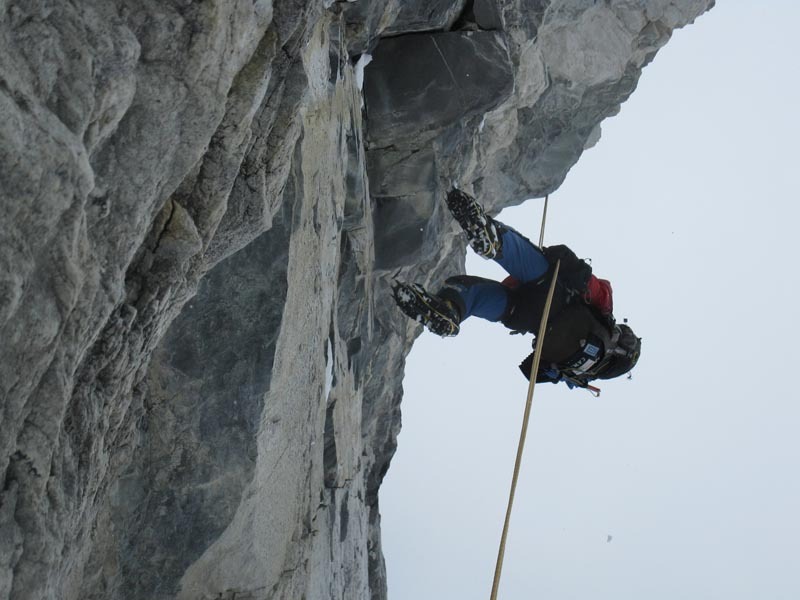 Boris who rappelled first was twice hit by the avalanches, and he dangled like a fish on a hook. It was good that our ice screws were placed in a reliable ice and stood the load. By 17.00 we descended to 6,600m, and suddenly the weather became crystal clear everything changed like in a fairytale. 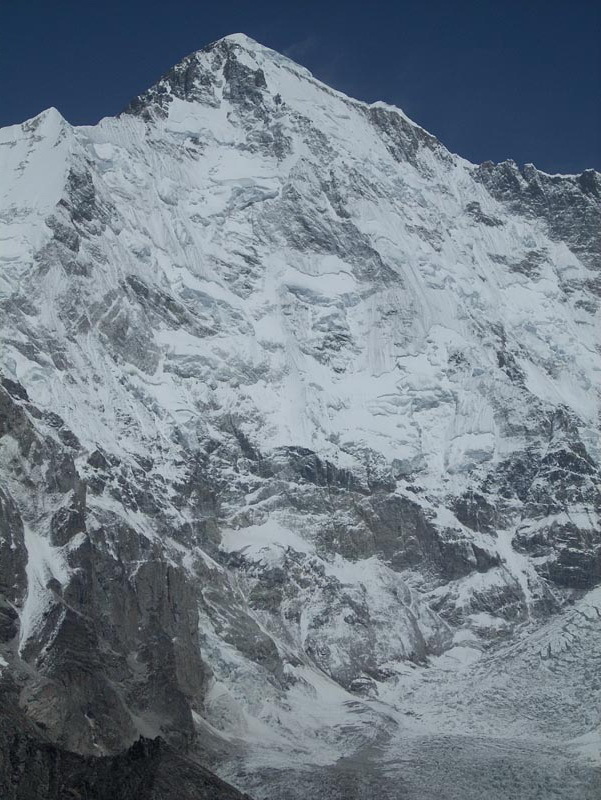 In the distance Mount Everest appeared and it became very cold. In the morning we continued our descent. For the first time it was warm after 5 cold days. 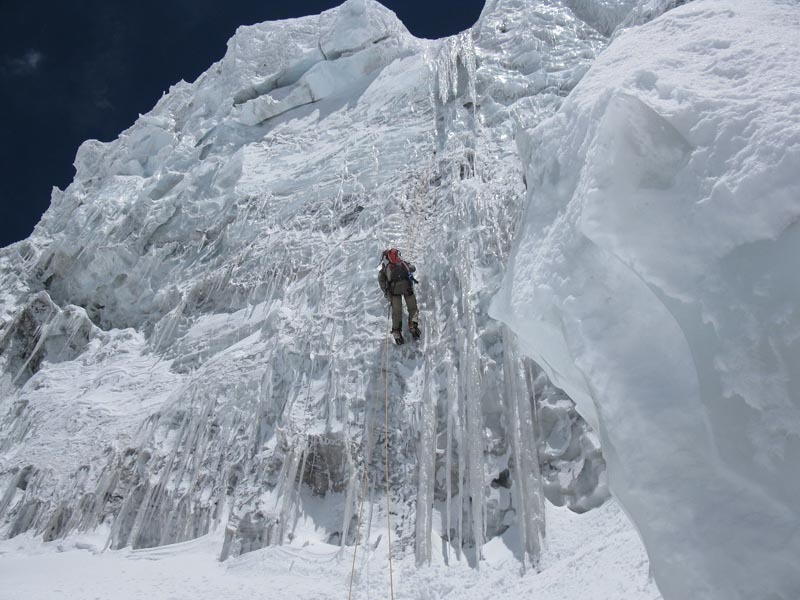 We descended along the icy walls via the overhangs. On the rocks we also had to swing on the rope to get to the face. By darkness we descended on the glacier and camped after getting a bit lost. This evening our gas was over. Next day we were falling into the snowed up holes in the moraine, dodging between the pools of water from melted snow, and we couldn’t slake our thirst. After 6 hours of descent we were in the Base. We were lucky that our cooks who were told to go to the valley after our ten day absence, withstood eleven days. And our Base was there. In the morning yaks came, we organized a caravan and went back. In Gokyo village the Nepalese arranged a real holiday for us, they entertained us, questioned, tried to bear up … It was a joy that we could hardly perceive – as we were too tired. I was able to embrace my thigh with my fingers – it was the second time in my life. Boris and I lost about 10 kilograms each. With all my heart I thank the sponsors of this ascent! «Newtech» and «Kazakhstan Kagazu (Казахстан Кагазы)» companies. Due to our joint efforts we could make a new super-difficult route on the face of one of the world’s highest peaks. 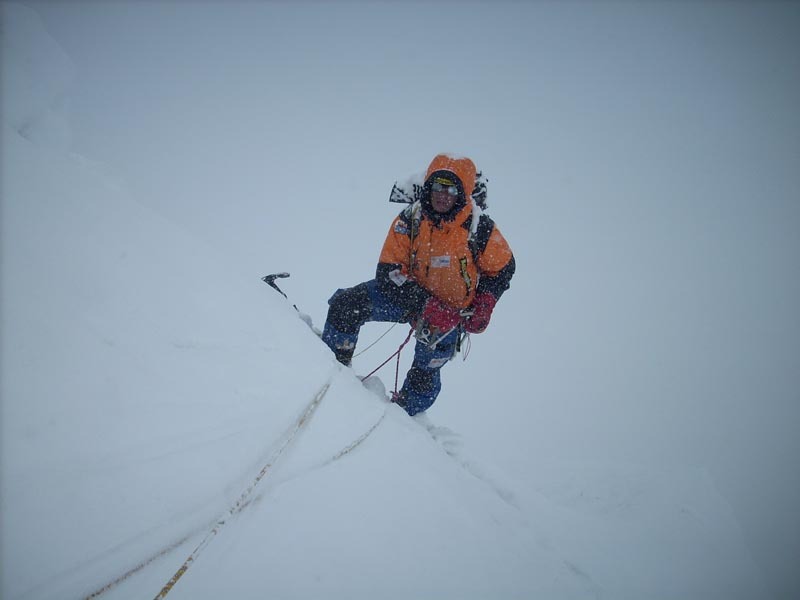 In addition, I completed the ascent program of the highest world’s peaks – fourteen summits with altitude more then 8,000 meters. 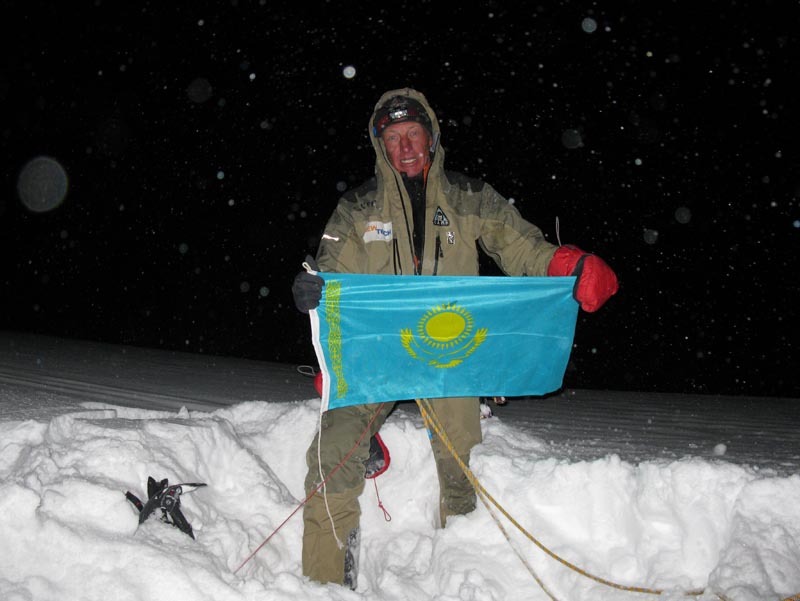 The Crown of Himalayas now belongs to Kazakhstan.